Browse for Voltage converters by vehicle make and model. 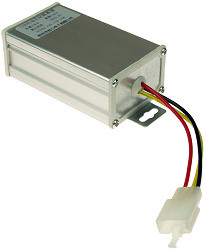 We have Voltage Converters for electric scooters, mopeds, and bikes. Our Voltage Converters change 36, 48, 60, and 72 Volts into 12 Volts in order to run 12 Volt headlights, taillights, turn signals, horns, and accessories. Voltage Converters are also known as DC to DC Converters, DC-DC Converters and DC/DC Converters.